Wow! Where did 2014 go? 2014 was nonstop-our oldest son got married to his incredible high school sweetheart and our youngest son graduated in May and went off to college, making us empty nesters. We took that opportunity to do some fun traveling. We also had some lows and challenges as I guess everyone does. I had not been really blogging much last year as I was doing some major “incubating” and taking a step back to assess. I have finally started to break out of my shell. (love all these egg references?) I have so much to share about my journey and tell you how I have finally found my passion: I don’t want to go into too much detail on this post as I want to talk about my 2015 word for the year. And I have some fun friends with upcoming posts that want to share their words with you in the next upcoming days. I think you will enjoy their words; I have such a great eclectic mix of friends with varying experiences and perspectives on life. As many of you know, I have been choosing of a Word for the Year since 2010, at the urging of one of my favorite yoga teachers, Mary NurrieSteans, while we were in class. For me 2010 was Create, 2011 was Pursue, 2012 was Delve, 2013 was Focus, and 2014 was Zen. Mary said to pick a word, write it and frame it so you can see it everyday. (Mine is shown on my bathroom counter). Choosing one word is usually more effective (and thought provoking and fun!) than making many goals and resolutions as they oftentimes get broken. I used to overwhelm myself with too many goals instead of focusing on one thing at a time. To read other Word for the Year posts by my friends in the past years, just type in Word for the Year in the search box on this blog. 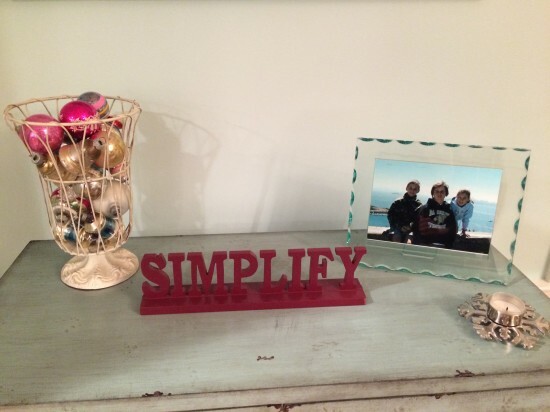 This year I have chosen the word Simplify. It means to make less complex or complicated, make plainer or easier, to reduce to basic essentials. It also means to streamline or clarify. 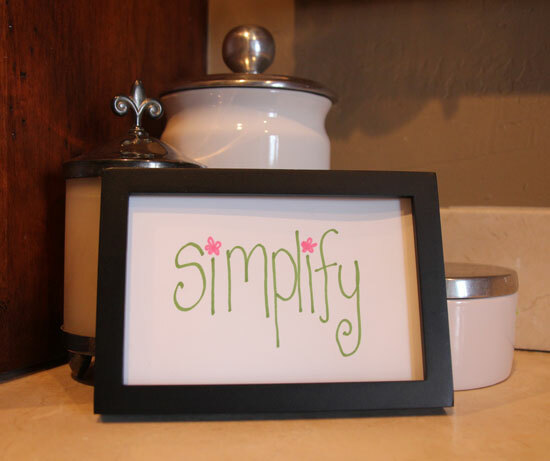 I almost chose the word Simplicity which means freedom from complexity or intricacy, but I like Simplify better because it a verb, versus Simplicity which is a noun. I guess the verb appeals to the “doer” in me and creates more action for me. I want to streamline my life and my business, Happy First. My whole life I have been an overachiever and volunteered for everything and tried to be Super Mom, Super Volunteer and Super Business Owner and was such a people pleaser. This has stressed me out. It has caused me to take my business in too many directions and I wasn’t being me; I was listening to everyone else’s ideas. I had lost my time for creativity and was being too busy volunteering, doing shows and doing paperwork. I wasn’t happy first! Simplifying this year to me will involve decluttering my home, computer, extra activities and my mind to allow space for my creativity. I am saying NO finally to things that are not on my path to creativity. I will be making major changes and streamlining my Happy First site and I feel so free about that. Also as empty nesters we have also had some fun redecorating some rooms at home with a more simple, clean look. It seems like all the stores are selling “mid century modern” now and I like the new (old) clean look! We have had some traumatic events this year that have just made me realize I need to focus on the basics, mostly my family and my passion, which in turn will help others. I love to encourage others and I want to share my journey. I will tell you more later about some of the great books I have read this past year and also what I have learned from some great mentors. My way of dealing with loss and stress has always been to be busy instead of slowing down and just being present. I am so ready for change now. I guess I had to go through the fire to see it. That’s what I have always wanted Happy First to represent-new beginnings. That’s what is so exciting, is that every day is a new day to make a change and take on a new adventure. That’s why if you are on my email list you get an ecard celebrating the first day of the new month. I especially love January because it makes us reflect on the past year and create zeal and new ideas for the fresh upcoming year. So come along with me, pick a word for yourself, and please share in the comments below! I love the sense of community when we all share great ideas with each other and encourage each other. We also have a new pinterest board-Word for the Year where people can share and get ideas too. If you would like to write a guest blog post for us just contact us at info@happyfirst.com. Here’s to a great 2015! Please follow my blog and join my email list to keep it coming to you! I took this pic a month ago at my super organized friend Lori’s home. 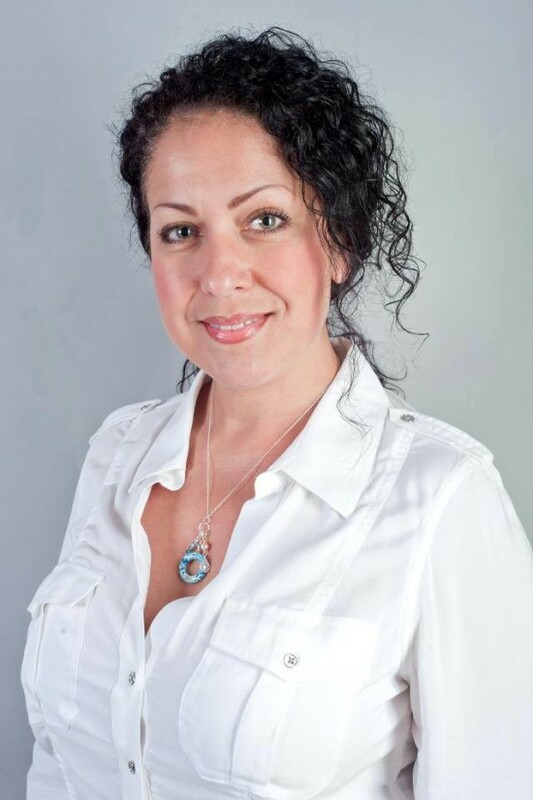 I think I am the one who is Blessed here, having Anna Pereira, creator and owner of Circles of Inspiration, being one of my guest bloggers this month! She so inspires me with her beautiful jewelry designs and her positive, encouraging attitude. (Check out her Circles of Inspiration Facebook page too, she inspires so many!). Anyway, I thought she would be a perfect fit for January, being that January is International Creativity Month! As you know, we have been coming up with our 2014 Word for the Year and here is Anna’s Word below, thanks for sharing yourself with us Anna! The New Year has arrived! I am so excited about the endless possibilities that 2014 brings us, and this year I’ve chosen a specific energy to really focus on as the months unfold. Blessed is my word for the year, and I’d like to share the reasons why with you today. When I first started my inspirational jewelry line Circles Of Inspiration, my goal was to create wearable art that would inspire people and surround them with the positive energy I had grown to love. 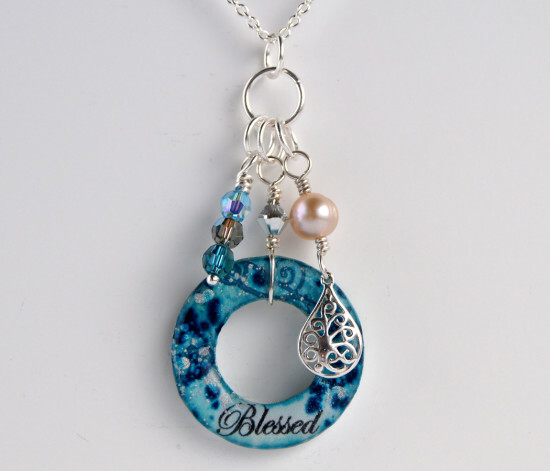 One of the first charms I created was the Blessed design, and ever since the launch of my line this particular piece has always stood out to me. To me, being blessed is a state of mind. I have experienced that all of us, all the time, and in all ways are completely surrounded by endless blessings –but in order to see them and receive them we have to be able to notice them. It can be so easy to walk thought life only seeing the negative, troublesome things that stand out – but when we do the work and find the diamonds in the rough and focus on them, miracles can happen. Being blessed means that we honor who we are as unique individuals, the path we walk, and the world we live in. We recognize once and for all that we are here for a reason, and that we are valuable. The moment we start recognizing and living our authentic value is the moment that the universe can finally start giving us everything we deserve. To be blessed is also to be a blessing. Like all things love-based, the more we give the more we are able to receive. When we walk through life actively trying to be a blessing for others, it changes things in and around us. It makes us humble and compassionate – and it opens our hearts so that we can heal ourselves deeply and help others do the same. This year, I am going to wear my own Blessed charm and use it as a reminder to be a blessing, receive the blessings, and express gratitude for the blessings no matter what form they may come in or even how small and insignificant they may be. 2014 for me will be all about saying Thank You and staying excited about the many good things ahead! Happy Tuesday! I meant to write this yesterday but didn’t get to it and I think it was meant to be because I took this picture late yesterday afternoon. 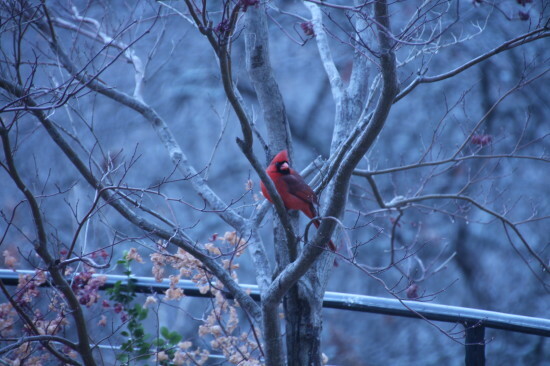 I was talking on the phone looking out the window and this bright happy cardinal was just sitting there wanting his picture taken! And it fits with what I want to talk about. I love January-way more than December. December is somewhat stressful and busy for me-I need to enjoy it more. It is hard for me to slow down in December. I love January because it is fresh, all about reflection and then new beginnings-which is exactly what Happy First is about. I love setting goals for the year and thinking of new possibilities and planning it all out. I love the fresh start of a new year. I’m really loving my new word FOCUS for 2013. And one thing I want to focus on is my creativity. I have gotten so busy running a business that I haven’t nurtured my creative side. Last year I read the book “The Artist’s Way” by Julia Cameron . It is a 12 week workbook designed to help you find your creativity. It suggests taking “art dates” with yourself and doing something creative once a week. So I will keep you all posted and I would love to hear ways you all do creative things. Anyway, I was reading the Sunday paper this past week and came across Harvey Mackay’s article in the business section. I love reading his articles. This week it was entitled “6 tips to help fuel creativity”. He talked about how creativity and imagination are vital for business and personal success. And he also said that January is International Creativity Month-didn’t know that! How fun is that? He talked about how being outside and spending time in nature spurs creativity. That is so true for me. I love to run and that is when I do some of my best brainstorming. I haven’t been outside so much because it has been so cold. But yesterday as I was on the phone I was gazing outside and saw that cute little bird and it made me think how good it is to slow down and enjoy nature. We live on some acreage so it is always so beautiful just to take the time to look away from the computer or some task inside and just to look outside! 1. Gather information – research-don’t think about the solution initially, just delve (love that word-was my word for 2012) into the subject. 5. Accept Mistakes-try things even if you’re not sure they will succeed. 6. Copy other Ideas-Don’t steal other ideas, but look at what’s done and try to do it differently. (I am always looking at trends but want to put my original spin on it). Wow, I get so inspired just reading what he has to say! I have so many ideas for 2013. I just need to FOCUS and corral all my ideas and give myself time just to have fun and create. What do you all want to create? What helps you get in the creative zone?